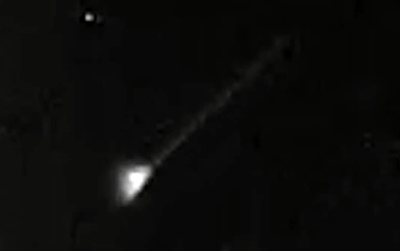 UFO SIGHTINGS DAILY: Triangle UFO Guards Earth Against Falling Perseid Meteor Shower Debris, Aug 13, 2015, UFO Sighting News. Triangle UFO Guards Earth Against Falling Perseid Meteor Shower Debris, Aug 13, 2015, UFO Sighting News. 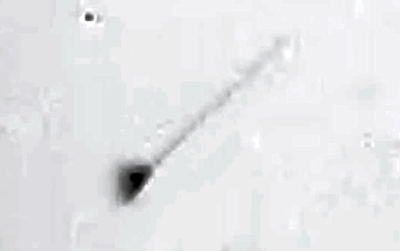 At 17 seconds into this video, a Triangle UFO shoots across the sky. The UFO has three sides and a dome in the middle, much like the classic disk with a hump in the middle. The UFO is helping keep the larger pieces of meteor from hitting the Earth. They always do these kinds of things, we just don't often get to see it with our own eyes. The Perseid meteor shower hit its peak Wednesday night and stargazers captured the sparkling show, which was even more dazzling this time around due to the moon's new phase. The light from the moon was less likely to get in the way of faint meteors, a plus for observers, and a phenomenon that hasn't happened since 2007.